Blondies... The original 'Brownie' before chocolate muscled in and took over. Here we do a version of a blondies recipe that features brown butter and hazelnuts. Often they are called 'Blonde Brownies' or Blondie Brownies'... we just call this recipe delicious! Check out these blondie recipes you have to try! Toast the hazelnuts on a sheet tray in the oven for 10-15 minutes. Roughly chop the hazelnuts in a food processor. Brown the butter over medium heat. Stir occasionally, it will foam and spatter as the water content 'boils' off. The butter is ready when the foaming stops and you see brown bits at the bottom of the pan. Grease an 9x9" baking pan and line with a parchment paper sling. 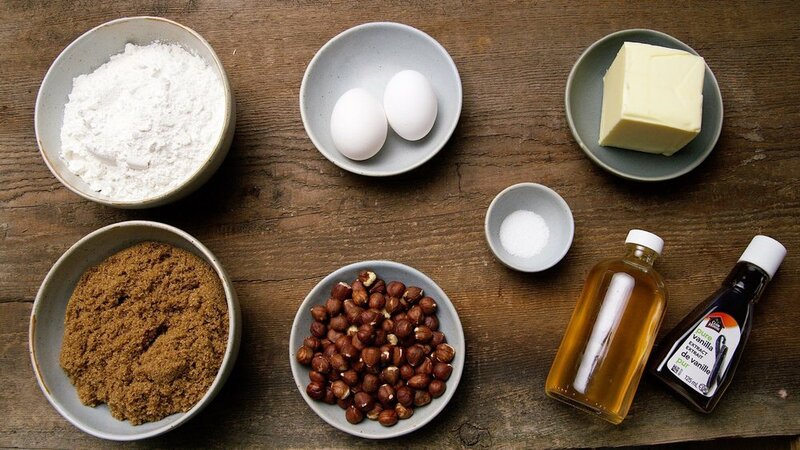 In a stand mixer, whisk together eggs and brown sugar. When light and frothy whisk in vanilla, cooled butter, and hazelnut liqueur. Add flour mixture to the butter/sugar/egg mixture, and mix just until combined. Scrape dough into your prepared baking pan and spread into the corners. You'll know it's done when you see a crispy top that's just starting to crack with firm slightly-browned edges.